I think being in our new Stargate chairs inspired Pearl. Pearl – Finally. 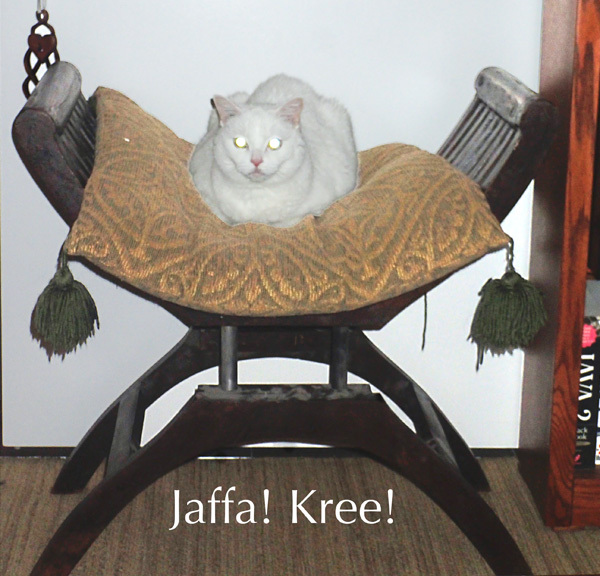 Jaffa! Kree! Me – Awwww, she found the news chairs. Honey, where’s the camera? Me – Ok, don’t move, Pearl… Pearl… Pearl (flash). Pearl – WTF? I said Kree! I should have food by now. Me – Look, the camera totally caused her eyes to flash out. Pearl – When I get my gold glove-thing you are so dead. Stupid talking furniture. Check it out, it’s totally the same chair. This was the only still picture I could find, but I recognized the chairs immediately. Me – Hey, did your new band poster come in? Niece (Who shall remain nameless. Well not really nameless because her mom says I can’t take away her name due to the inconvenient fact that she’s not my kid and because she’s pretty sure you can’t go around without a name.) – Yah. Me – Can I see it? Me <Looking at a picture of Blood on the Dance Floor – seriously I couldn’t make that up – and realizing I’m officially old enough to ‘not get’ a whole generation of music.> – Oh, they’re goth. Niece <Eyes rolling so deeply back into her head I was worried I might need to do some sort of ill-defined eye-based fist aid.> – No. Auntie. They are the opposite of goth. Me <Deeply ok with not being cool.> – No honey. I’m the opposite of Goth. Anyway, an amazing friend found these chairs at an auction (Pretty sure they were set pieces. Are so! Don’t ruin this for me.) and thought of me. For the record, it is always ok to think of me when you find geeky Stargate related things. As soon as I get these cleaned off they are so going to be my favourite new writing chairs. Who couldn’t be inspired while sitting on a Goa’uld throne? My cat talks to me. Not in actual words, but in the way she looks at me, and in the interpretations I give her actions. (Usually her voice sounds remarkably like mine…) Today, spend five minutes watching your pet in an activity – prowling, eating, running, playing, silently judging you…whatever. (If you don’t have a pet, most communities have a dog park so go watch a stranger’s pet, then give that animal a voice. (If it helps, actually start talking to yourself in their voice…this is better done out of earshot of those who may not understand the creative process.) Once you have found their voice write down what you think your pet is saying. They may be having a conversation, or thinking, or just rambling, but I bet you’ll find a story there. Spend fifteen minutes telling your pet’s story. Happy writing. Head up I lowered my lashes to the rain causing the world to flicker in and out of focus. The view at my feet was clearer, but what I was looking for couldn’t be found by looking down. So I looked up and out through the flicker, obscured but searching.